Some of our guests prefer to leave their automobiles at home. Luckily, there are a number of options for travel to and from the Port Townsend area. The Ravenscroft Inn is on the Port Townsend Shuttle line. The shuttle can get you back to the Inn if you need a lift after walking or bicycling. Start with SoundTransit light rail from the aiport to the Seattle Ferry Terminal (Coleman Dock). Take the WA State Ferry to Bainbridge. 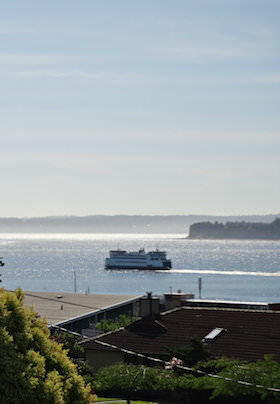 Take a Kitsap Transit bus to Poulsbo, WA from the ferry terminal on Bainbridge. In Poulsbo, transfer to Jefferson Transit to Port Townsend, WA.